Though I would like to keep this to myself, I need to write about this weekend because it was…emotional. The catalyst was the home check with the greyhound adoption group. As much as I want to separate the dog from the family from the partner from the question of ever having a child of my own from the art, I just can’t. The visit set off a paroxysm of emotions, revelation, and reevaluation. There are lots of reasons why I want a dog (reasons that don’t have to do with family/relationship stuff) and a few really good reasons not to get a dog (not least of which is the fact that I am mildly allergic). Emotionally, this has all been unexpectedly risky territory. Z was supposed to come straight from work to catch the last half of the greyhound interview, but instead, he decided to stop at a store. He ended up being really late, and would’ve missed the interview entirely if I hadn’t called to remind him about it mid-interview. It seemed that he had either forgotten about the interview, which is worrisome because, while the dog would be “mine,” there’s no getting around the fact that it involves him too. It was that, or he thought he didn’t need to be there, which communicated to me that, well, he doesn’t really need to be here, in this relationship. We worked through the misunderstanding/forgetting. However, it left me feeling, once again, that I’m a little too alone in this relationship. Not entirely. But, when it comes to change, change that involves me, and change that involves the relationship, he’s not always a participant. I’m very independent, and it’s hard for me to suss out how much I need my partner to care and what he needs to care about. I can’t tell if what happened is, like, totally acceptable, or, like, totally unacceptable. I know that something doesn’t feel quite right about it, and that’s all I’ve got so far. On one hand, he is a great match for me. He lets me be me. He’s encouraging, supportive, loving. We both value not getting caught up in our identities as a couple. We’re able to have separate interests and time apart. On the other hand, I worry that it’s all a bit of a guise we use to push each other safely away to avoid real intimacy and real risk. As it turns out, a simple conversation about whether or not to get a dog brings all of that up. This entry was posted in enlightenment, family, life, love, relationships and tagged greyhound adoption program, relationship, retired racing greyhound on January 28, 2014 by sherewin. I wanted to learn to knit for years before I finally got the chance. It was on my ‘things to do after graduate school’ list. However, I didn’t have to wait that long because in my last year of graduate school a new student offered to teach a group of us to knit. 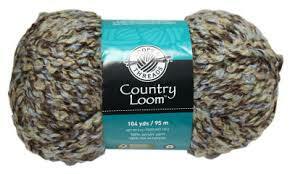 Before the lesson, she instructed me to go out and buy a big pair of knitting needles and a chunky skein of yarn. Later, I would learn that the chunky yarn knits up faster, which is encouraging for new knitters who spend the first few lessons staring at a strange little tangle of knots hanging from a stick. I can’t remember how many times we met (just a few, I think), and, in those sessions, she taught me to knit! So, I’ve been knitting. In the past few years, I’ve knitted all manner of squares and rectangles and even branched out to a pretty terrible-looking hat (more on hats later). For Christmas, I made a blanket for my nephew, which turned out to be bigger than I originally intended (he’ll grow into it, right?) The blanket was fun through. It was simple, and it didn’t take a lot of concentration—it was something I could do while watching a show or in a meeting. I’ve decided to tackle a few more “baby blanket” projects, and now that I’m a little more confident, I’ve decided to start working more with textures and borders. My first post-holiday project has been a baby blanket for my cousin’s son’s first birthday. Since he’s a year old now, I wanted to make a blanket that was a little bigger than the patterns I was seeing online for newborn baby blankets. Below is a description of the pattern I created (which is not in typical knitting pattern speak). If you try it out or alter it, please let me know what you think! I used four skeins of “Loops & Threads Country Loom” in a color called “driftwood.” I chose this color because it has a natural green tone to it that I hope will complement the baby’s current bedding. Row 8: I knit stitched seven stitches, marked it, then purl stitched 56 stitches, marked it again, and then knit stitched seven stitches. Row 9: I knit stitched seven stitches, marked it, then knit stitched 56 stitches, marked it again, and then knit stitched seven stitches. Row 10-? : I did a regular stitch for the first and last seven stitches, and then I alternated knit stitch and purl stitch until I had almost finished four skeins of yarn. I was aiming for about 36 inches long, but mine ended up being about 45 inches long—which looked about right. 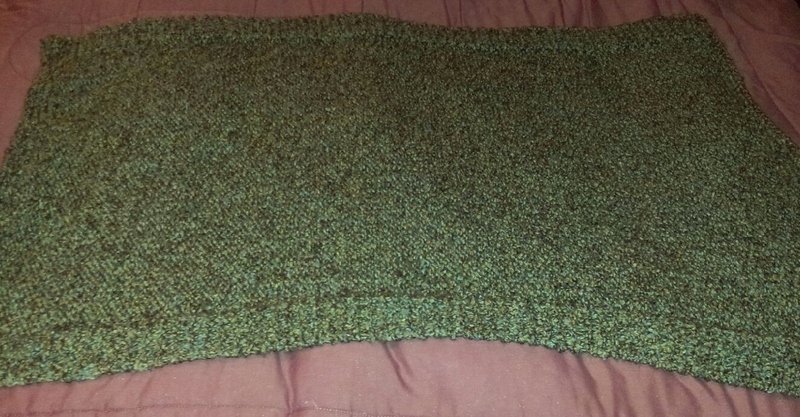 Last 7 rows: I did a regular knit stitch for the last seven rows and then cast off. Notes: I created this pattern myself, and I really liked the way it turned out. However, if I had to do it all over, I would probably knit ten rows instead of seven before beginning to alternate the knit/purl stitches in the middle of the blanket because the resulting boarder around the edge of the blanket is not quite as long as the border around the sides of the blanket. I was, however, happy with the length of sides of the border, which was the seven stitches that I marked off on either side of the blanket. This entry was posted in family, knitting and tagged baby blanket, knitting, Loops & Threads Country Loom in Driftwood on January 25, 2014 by sherewin. Last night I dreamt of a large, furry bumble bee. 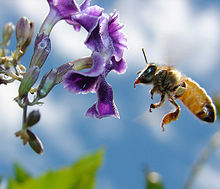 It was collecting pollen from a large fuchsia-colored flower and several other bees were glommed on to it, struggling to take clumps of pollen from its legs and back. All of which may or may not be related to the fact that yesterday I had somewhat of a third-life crisis moment. Actually, it’s been going on for a few days now as I try, really, really try to examine my reasons for wanting a dog. I think it’s about a walking partner and a face to talk to while I’m writing, but what if it’s about trying to create a family? That line of thinking led me down a rabbit hole of apartment searching, which was totally depressing because rentals can be so disgusting and overpriced. Then that lead me down a rabbit hole of looking at houses for sale. Do I want to live in this neighborhood? Can I afford to? Do I want to be closer to work? Do I want to live out in the country, with a little more space and room to breathe? I ended the day feeling like all of it was wrong, like it wasn’t time for any of that just yet and that I need to set my sights a little higher. I have a tendency to over think things until the moment is almost gone, wasted. However, I also felt strongly that none of the possible future scenarios were right yesterday. At least not yet. I came away more focused on the things that are meaningful to me right now, and that has to do with writing and being creative. I might get a dog. I might buy a house. But maybe not yet, and even if I do, those won’t be the most important, or possibly even lasting, aspects of my life. This entry was posted in art, books, enlightenment, family, garden, life, love, relationships, work, writing and tagged bees, dreams, future scenarios on January 20, 2014 by sherewin. 1) Entertainment. They’re amusing. I’m not a fan of every dog or every breed of dog that I meet. (I try to judge a dog based on the individual and not the breed.) However, there are traits linked to certain breeds that I absolutely adore. For example, I find the shy, mortified look of many sight hounds to be amusing. I feel like I can totally relate. I also absolutely love the peaceful energy of a big, retired racing greyhound. There’s nothing like it. 2) Exercise. They help you exercise. I run several times a week, and I like to go for walks. But, I want to have the kind of life where I take a meditative walk to turn off, tune out, and unwind every single day. A dog forces that behavior. 3) Socialize. They help you meet new friends and socialize with existing friends. My last boyfriend had a dog. Each day, the dog required one long walk and a romp in the dog park. Yes, this took up a significant amount of time, but there were also dog-loving people at the dog park and new friendships were forged. It was lovely. Also, people who already have dogs have an excuse to get together to let the dogs run. 4) Adventure. They take you on adventure. Of course there’s the walk and the dog park, but occasionally you and your dog need something more. Enter: hiking adventure. I love to hike. I would like to do it more and something tells me the guilt I will feel as I stare into my dog’s disappointed gaze is enough to get me out the door and up the canyon. 5) Friend. They’re [wo]man’s best friend. They’re good company. I spend a lot of time working and writing at my computer. I love old-timey pictures of writers and their pets. It seems like all successful writers have a cat or dog. It makes sense for the lifestyle, really. A dog would help break the monotony–a reminder to get up, take a break, and take a walk around the block. This entry was posted in life, writing and tagged greyhound, greyhound adoption program, retired racing greyhound on January 13, 2014 by sherewin. 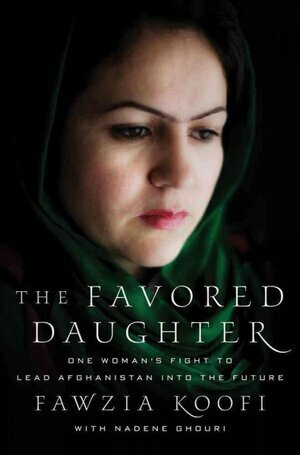 I just finished reading The Favored Daughter: One Woman’s Fight to Lead Afghanistan Into the Future by Fawzia Koofi. It was a fascinating glimpse into the life of a Middle Eastern woman and a reminder of how quickly a dictatorship can destroy people’s lives, especially women. Several years ago, I also read Inside the Kingdom: My Life in Saudi Arabia by Carmen Bin Laden, and it was also spellbinding. The books are both from the perspective of educated women from the Middle East. I love getting their perspective because that experience is so vastly different than my own and also because it is represented so infrequently in literature. On one hand, these women are very similar to me in that we are all highly educated. On the other hand, I have much more relative freedom here in the US than many women in the Middle East. A highly educated woman living in an incredibly conservative patriarchal society is fascinating. What I loved most was Koofi’s description of her childhood, growing up in the remote mountains of Afghanistan to a politician father in a polygamous family. It illustrated the bygone days when rampant spousal abuse and deadly sexism prevailed. The book provides a lens to a culture that is very different from my own. The passages about her childhood and early womanhood are lovely and interesting. It seemed that the love and unusual attention her mother gave her, even though she was “only” a girl, inspired her to a different life than one lived by most women in Afghanistan. It is no spoiler than Koofi goes on to have a political career and that is where the book falters a bit. The last few chapters become a bit repetitive and have a distinctly political. The book ends in a tone that is political and not always in a good way. Not at that her points aren’t valid. They are! And, she is incredibly inspiring and her work as one of the few female politicians is no doubt incredibly important. All of that is gripping and exciting—but it’s not as exciting as the personal view she takes of her life in the first two-thirds of the book. By the end, she sounds like a politician who is on the campaign trail—a politician who might one day become the president of Afghanistan. This entry was posted in books, reading and tagged Afghanistan, book club, Book Reviews, Carmen Bin Laden, Fawzia Koofi, Koofi, women in Afghanistan, women in the Middle East on January 7, 2014 by sherewin. I’ve practiced yoga since around 2005. I was curious about it and loved it immediately when I started practicing. I’ve also been teaching yoga since 2008, which I absolutely love. After I first began teaching yoga, I also started teaching a 30-minute meditation class that started right after my hour-long yoga class. I jumped at the opportunity because I’ve always enjoyed the meditative aspects of yoga. I ended up teaching meditation for a few years, but haven’t had the chance to start up again since moving to Utah. Now, it is said that all good yogis have their own personal practice, but that has never really been true for me. I prefer to practice yoga in a group, whether that be at a gym, Bikram yoga, in an Iyengar or Yogafit training, or even in the classes that I teach. While it is easier to be accountable when you’re meeting with another group of people to practice, on some sort of metaphysical level, I also appreciate moving through the asanas with others. Intangible and indescribable as it sometimes seems, I draw strength and connection that I crave when I practice yoga with other people. That said, I’ve also never really had my own meditation practice either. I know that Transcendental Meditation (TM) is all the rage, but I have to admit that I recently heard an interview about TM that sort of made my hair stand on end (in a good way). It was the kind of energetic response that makes me take notice. Turns out, there are some TM practitioners around here, and I’m looking in to possible taking an intro class with them. 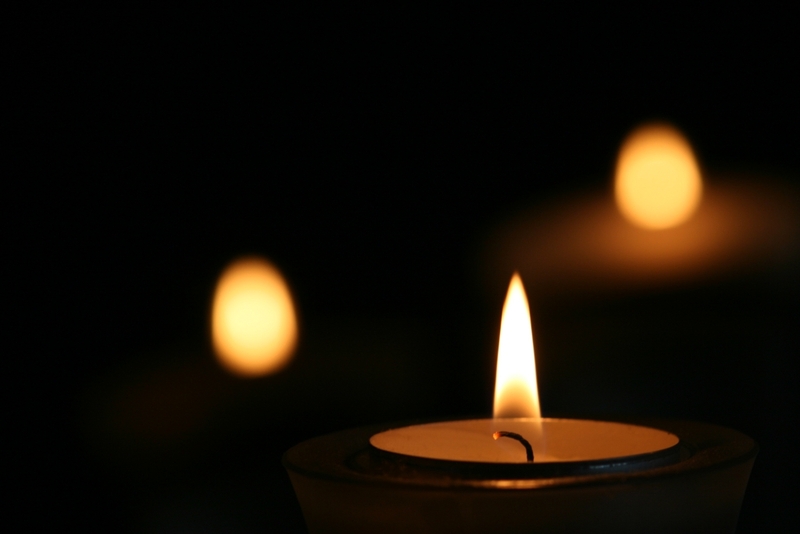 In the meantime, I’ve decided to use the New Year to start meditating on my own. Let me be honest, the thought of meditating sort of makes my skin crawl. It seems irritating, agitating. It seems like an epic, annoying waste of time. However, yoga has taught me that because I have such a strong response, it’s probably something that I really need. In yoga, I tend to hate poses that I need the most (i.e. camel pose/ustrasana). So, I’m using the New year to implement meditation. I’m not sure what I’ll get out of it, but I’m going to meditate for 10 minutes every morning and 20 minutes every evening, and I might eventually up that to 20 minutes in the morning. I’m going to do if for 31 days–the entire month of January. I hope that the practice will help me use my time more wisely and purposefully. Of course, I also hope I’ll gain some deeper insight about my life’s path. More than anything, this is an experiment. I have no idea what it will be like, and that’s why I’m going to give it a try. This entry was posted in enlightenment, life, yoga and tagged meditation, Transcendental Meditation on January 2, 2014 by sherewin.